I feel there's been a real change in the kinds of skincare cleansers on offer lately. Gone are the days of harsh foaming cleansers that strip the skin with more people opting for balmy/oily cleansers. With a wide range of balm cleansers on offer, I thought I'd share my opinion on 4 different kinds to help make the decision a little bit easier. The newest one in my collection is the Elemis Pro-Collagen Cleansing Balm which I received a sample of at a blogger event recently. This is probably the best option for anti-aging purposes, however it is the most expensive. A little goes a long way thankfully and it feels very luxurious massaging it into the skin. It's probably the most oily option but I find it very easy to remove and suitable for morning use. A good dupe for the Elemis product is the Suti Purity Organic Restorative Balm. It smells identical, plus comes with a slightly less expensive price tag. The results are exactly the same, uses 99% of organic ingredients and you need even less product per cleanse so it will last even longer. 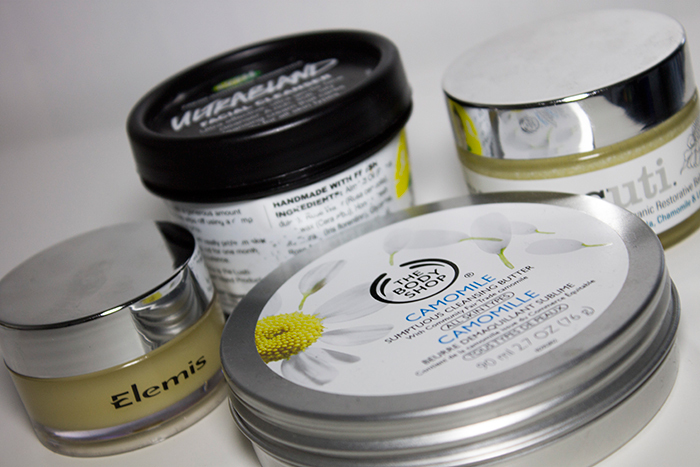 An easy to find, budget option would have to be The Body Shop's Camomile Sumptuous Cleansing Butter. I find a little goes a long way with this stuff despite looking like you don't get a lot of product in the tin. It is very gentle, however I would say with the addition of shea butter it's probably not all that suitable for acne-prone skin. The best balm cleanser for sensitive skin has to be the Lush Ultrabland Cleanser. While it might not smell quite as pleasant as the others due to the lack of fragrance included, it's very gentle on the skin. I've repurchased this around 3-4 times and I can always rely on it to sort my skin out. My only criticism is that it can leave a trace so it's not all that suitable for morning use. Out of all the balm cleansers, if I had to choose a favourite I'd always choose the Lush Ultrabland Cleanser. While I love each of these cleansers individually, I feel like Lush's offering is the one most suited to my skincare needs and will be the one I repurchase more often. Are you a fan of balm cleansers? Which one do you find the best? Let us know!